Mindo Ecuador – My friends and I walked part of their property this past week, and we noted a clematis-like vine that sprawled along a damp ditch and climbed across anything in its path. Stopping to inspect a butterfly with delicate glass-like wings, we discovered a treasure of insects we might have otherwise missed. How often we chase the elusive rainbow, while an equally satisfying treasurer lurks intimately nearby! Very limited for time, I share these photos, though the butterfly pencil studies are as elusive as that rainbow! This week, slow down and inspect what’s lurking nearby. You might be rewarded with some amazing jewels! In another hummingbird-watching area, this precious little one seemed to be watching me! Does anyone have any idea what species this might be? Is the yellow crown real or is it a dusting of pollen? 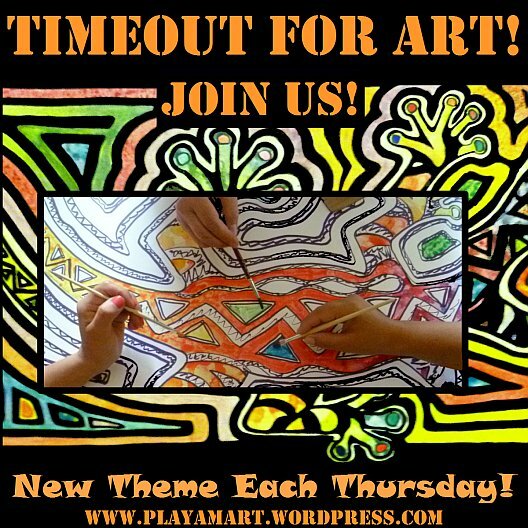 This timeout for art is posted a bit early while taking a really fast timeout for internet while in town! Most likely I will be offline until Tuesday of next week. Lovely post. The photos and your sentiment expressed through your commentary are wonderful. What a lovely reminder to take the time to look a bit closer. beautiful photos and words… I don’t know of even yellow crowned hummers, maybe it is pollen or a hybrid? Great to hear from you, Z. I love the photos, especially the one of the blue and yellow bug–whatever it is. Kind of jewel-like, isn’t it? Take care and see you Tuesday. Lisa – it is so good to hear from you again. You are so right, we often hurry on past the beauty trying to see whatever we are after and miss so much. Luckily I walked around with many little ones hanging on to my finger and asking, “Dad, what is that?” Being with children taught me to look down and actually notice things. We look forward to having you back in our blogging circle! Stop. Take the time. Yes. Good advice. Beautiful photos and observations. That white flower is as heavenly as the butterflies it attracts. Am glad you are having a moment to take a walk. 🙂 Lovely area. What a fantastic capture !!! I think a crown of gold! Beautiful photos Lisa, I love the way you find time to show us the beauty you find all around you. “It is interesting to contemplate a tangled bank, clothed with many plants of many kinds, with birds singing on the bushes, with various insects flitting about, and with worms crawling through the damp earth, and to reflect that these elaborately constructed forms, so different from each other, and dependent upon each other in so complex a manner, have all been produced by laws acting around us. . .
What a great discovery of some of nature’s insects. Lisa, what a lovely bunch of flyers you have captured for us. And an amazing blue hornet! (wasp?) I didn’t know they came in blue! The ones that have been there all the time, the ones out by the edges of our pond, burst into bloom! There are many flowers I have discovered here and there and had no success with growing from seed (ironweed, cardinal flower, and other natives) and now I find them in situ here on the mountain. I guess sometimes we just need to be patient, and then we are rewarded with the gifts that we seek. Lovely photos! You might enjoy what I “caught” yesterday in my post today: http://sustainabilitea.wordpress.com/2013/09/19/when-is-a-hummingbird-not-a-hummingbird/. I wish I knew the names of more flowers, insects and birds, but right now there’s no time to learn them as I’m continually unpacking. Enjoyed your post very much. Wonderful post as usual Lisa. Great photos and good advice. We should be taking time out just for the sake of taking some time out. Wow! What a great shot of a hummer! Well, they’re all mighty fine, but I’m on a real hummingbird kick these days. Beautiful butterflies you have got over there! Summer is gone here, so I enjoy your pictures immensely. Have a great weekend. Beautiful finds Z! It can be amazing what you find when you only look closer! You certainly found the pot of gold. 🙂 My internet has been horrible and I’ve been having an art block. I’m not quite sure what to do when I have no inspiration to draw or paint. Hopefully, I’ll be back in the mood soon. We moved the woktenna so I have a strong signal, now. Things are looking up. Plus, we are planning a trip to Ecuador for next March. I really want to go to Yasuni National Park before it is too late. Have you been there? Just an hour and three-quarters from the equinox, and we are all happy as hummingbirds! We’ve had rain all over Texas (nearly 3″ here) and now the first front has moved through. It’s about 80 now, and down to 68 tonight – and I’m getting ready to join a friend for a walk through a local nature area. It’s such a relief to have the windows open and the breeze blowing! I hope you’re feeling as refreshed as I am! This post you took me by the hand and led me into your magic land. The path to those dainty white flowers that complemented the butterflies perfectly.